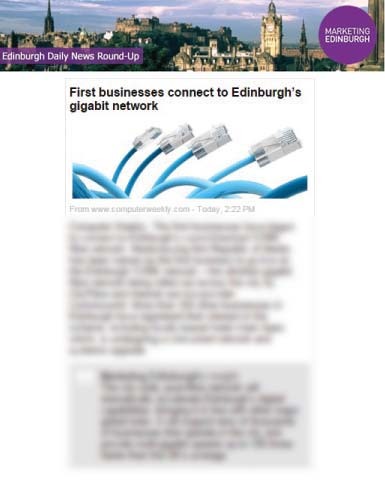 Network and Telecommunication specialists Commsworld has once again been the pick of the press recently, announcing it has helped make the first official connection to the ultra-fast game-changing network: the Edinburgh CORE. With the news that media buying agency, Republic of Media made the first official connection, we interviewed Director Simon Crunden, getting his thoughts on the real business impact that the new network will bring. We then drafted an engaging and not-too-technical press release to tempt the interest and convey the sheer importance of the project to the key influential media figures. The story did well, featuring in print and online in arguably the most prestigious Scottish news outlet, The Scotsman. This is an ideal ABC1 demographic outlet, with typically over 30,000 readers in print and a hugely expanding web presence. The first connection also made the Lothian Business News – again reaching to the heart of the Scottish business community. networks are an ever growing requirement. Finally the story made on key technical site ComputerWeekly, ensuring industry awareness for the Edinburgh firm as it looks to boost its reputation and ability to recruit top talent and encourage important collaboration. An added bonus for this coverage was when the story was picked up by Marketing Edinburgh in its highly influential and respected newsletter. Do you want transparent, business boosting and intelligent media relations?